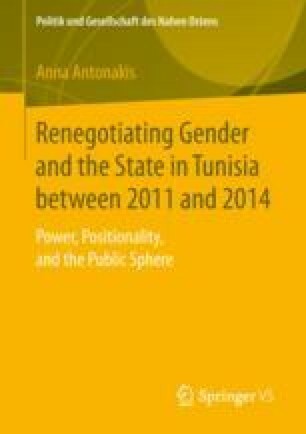 In this last chapter, I argue that the uprisings of December 2010 have certainly cleared the way to renegotiate gender and discuss new feminist approaches on a more local level in Tunisia. While these developments may hardly be visible within the institutional or representational dimension of the public sphere, I claim that they induce long-term change in gender relations. The women’s counterpublics and women in counterpublics analyzed here, target “patriarchy” in its various everyday expressions and manifestations and refuse to be absorbed in formal political processes.